Crime Clusterf@$k/Political Pantomime 20mts, 18dys: The Gladys Affair! 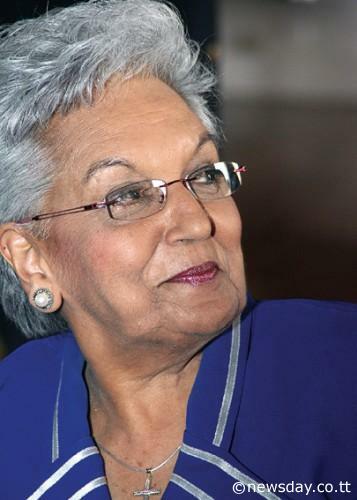 Gladys Gafoor, investigations into her time as deputy chairwoman into the Integrity Commission has put the country in a tailspin. Photo courtesy Newsday. Well like this Pantomime cyah get no sleep because kuchoor, lawlessness and corruption flowing fast and furious in this place. To Gladys the badiss being dismissed. And now, Newsday get raid and Sgt Koon Koon saying nobody order the raid, he do it on he own steam. Doh hot yuh head! http://www.guardian.co.tt/news/2012-02-10/no-directive-given-says-senior-officer So who is the judge that issue the warrant to search Newsday and Andre Bagoo home, Sgt Koon Koon? The Judge ketch a vaps just so and issue warrant? Meanwhile the Integrity Commission issue a press release to say they asked a for a full investigation. But the vice aint done there....Everybody calling on Glibbs to account and explain and we cyah find Glibbs, yet....maybe he crop-dusting! Or maybe he dealing up with the shipment of uniforms he order that just sit down doing nothing....Donna Cox where you does be getting all this draft, girl? Gibbs, Gladys and Raids have we so tootoolbay, nobody aint even paying attention to Sita's refusal to take she transfer quiet quiet. Sita want to call the shots and dictate the pace....either that or stay in she place! next week might be round 4 of PantyGate....brace for it people. In all of that there have been several brutal murders in the past 2 days. 2 Chutney and a Rama tonight....somebody pocket hadda buss! De Vice Cyah Done!